Hi there! today I’m sharing a review for a sweet, contemporary M/M Christmas romance from Amy Lane. You know I’ve adored her heart-wrenching books, most recently SELFIE and THE DEEP OF THE SOUND, but her newest release is a giant fluffy blanket to wrap yourself in. FRECKLES features a shy lawyer, a bold vet tech, and the puppy that brought them together. It’s also a part of the 2016 three book Holiday bundle offered every year by Riptide, and 20% of the proceeds are donated to The Trevor Project, which provides a suicide hotline and counseling assistance for LGBTQ teens, in particular, in crisis. Carter Embree is a lawyer with a conscience. I’m not saying he’s the only one, but Carter pretty much feels that way working for his slimeball boss. He’s unhappy in his job, but the pay is great; too great to give it up on a whim. Plus, he’s been there for years, and he might could get a promotion, though he’s not gonna hold his breath. One night, while feeling particularly low after his current boyfriend of several months had walked out with a Post-it Note good-bye, Carter meets the next love of his life: a two-pound ball of eyes and fur literally dropped into his hands by a kid at the grocery. And Freckles, as novice dog owner Carter dubs her, has fleas. Rushing off to the vet clinic at his nearby PetSmart, Carter meets lanky, flirty Sandy, the nightly vet tech. Sandy’s sure Carter’s a loony, but he sees the sweet vulnerability behind Carter’s guileless eyes and pleasant, but plain, features. And, Carter’s determination to be a good pet parent is pretty heart-melting, too. Over the course of nudging Carter on his path with Freckles, Sandy’s quite smitten. He’s also happy that Carter’s a quiet sort of guy, that he’s not big on clubbing and going to all the It spots. Sandy’s 33, but he’s back in college, studying to be a veterinarian, so he’s not well-off. Meanwhile, Carter’s just happy learning how to care for Freckles, and falling for Sandy–even if he knows his mother would never approve of him dating someone so undistinguished professionally. That said, Carter’s been branching out, taking his own cases for disgruntled pet owners who deserve restitution after their beloved animals were injured or killed. His newfound perspective on both life and love leads him to make even more decisions that alter his life, in the best way. This is a quiet romance, with gradually building steam that’s nice, but doesn’t exactly burn up the page. The secondary characters feel as real as the mains, with truly earnest people populating the story, which is usual for this author. Freckles is a sweetheart, even if she craps all over the carpets. Having lived with pets I’m aware that establishing the power structure early on is KEY! !, but Carter’s a pushover in all aspects of his life, including pet training. This is his real character flaw, and I was happy to watch him grow into being a stronger person, and standing up for his own happiness, even if it’s difficult, inconvenient or less lucrative. Carter has to become his own hero, in order to be a good partner to Sandy, and all his baby steps add up to just that. Very sweet, and come on now, a PUPPY!! An enjoyable read that won’t twist you into an angst-ball. Interested? 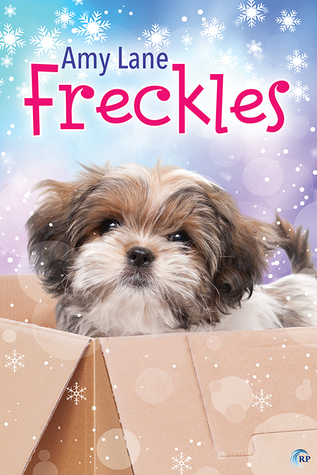 You can find FRECKLES on Goodreads, Riptide Publishing, Amazon, Barnes & Noble, and AllRomance. To purchase FRECKLES with two other books at a BIG discount, and for The Trevor Project donations, click the Bundle Page here. Amy Lane dodges an EDJ, mothers four children, and writes the occasional book. She, her brood, and her beloved mate, Mack, live in a crumbling mortgage in Citrus Heights, California, which is riddled with spiders, cats, and more than its share of fancy and weirdness. Feel free to visit her website, blog, or on twitter and Facebook where she will ride the buzz of receiving your e-mail until her head swells and she can no longer leave the house.